This tool box tour is a video you guys have been asking more about for a long time. 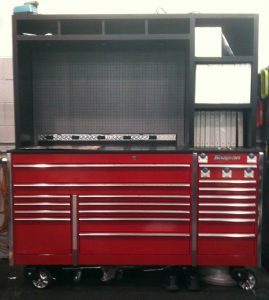 As you know tool box organization is vital to a professional mechanic. To be successful, we have to work both smart and hard. Professional mechanics set their toolbox up in a way that promotes efficiency and cleanliness. Today I take you on a tour of my red Snap On tool box. This has been my shop tool box since early 2009. You will notice some pretty interesting things about this box, for example empty drawers. Don’t worry I will address that in the video. As many of you also know I shot this right before leaving the dealership as a full time Volkswagen technician. If you want to learn more about why I left the dealership, check out The End of an Era. Trouble viewing? Watch “Snap On Tool Box Tour” on YouTube. Charles your tool box remind me of the one I still have , retired 2012 and I try to hang on to them for some time yet although I still do some work on my Jetta TDI. Some from Crane, Hoist, Mercedes Benz and BMW and when you work on these beast you need to have the tools. any way Humble Mechanic enjoy your days working for an HONEST living. Liking the custom hutch. One thing I found really handy was cutting down a 2 1/2″ thick butcher block counter top for my work surfaces. An 8 x 2.5 foot long block is less then $150 bucks, and nicer then what you can get from Snap On. Cut it down and you got 2, one to cover your box, and one to do a work bench. I see a lot of techs using stainless tops on there boxes, they clean up nice, but the butcher blocks wont damage parts if your working on the bench, and they seem easier on your tools. Really important if you’re working on vintage cars rare parts. Keep up the great content!